Vue doesn’t have a parallel light source that creates a fixed width beam so making search lights and other lights with parallel edges requires a little work. Here is one way I’ve used, it may not work for all situations but it works for some. All the values I give here are those I used to make the example picture (above). We need to allow a light placed under the ground to shine through it. Select the ground in your scene. Select the material applied to the ground. In the Advanced Material Editor in Effects uncheck Cast Shadows. 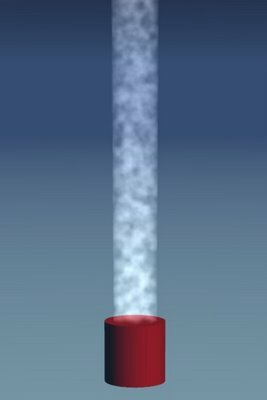 You’ll need to do this for any objects that might block the beam of light your going to create, so in my simple example above I had to uncheck it on the red material on the Cylinder too. If you need these objects to have shadows in your picture you’ll have to create two renders (one with the light beam but without shadows and one without the light beam and with shadows) and then composite the two images. We’re going to use a little geometry to make the beam look like it has parallel edges even though it doesn’t. Now create a spot light in Vue. Place it under the ground shining upwards at a Z position of -500m. Now set the spot lights spread to 0.25 degrees and its power to 500. 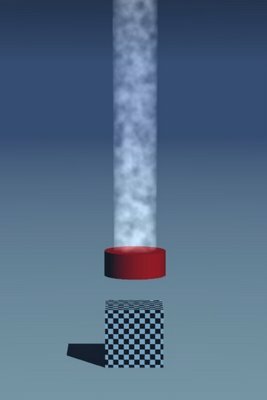 In the light editor enable volumetric lighting and increase the Intensity to 10 by typing it into the box. Now when you render the picture you should get a beam of light shining from the ground with fairly parallel edges. That will do for a lot of scenes but what if you need the light to appear to start from an object that can be seen under, like the crude example below? The trick here is to use Variable colour in the light editor. Select the spot light and go into the light editor and select the Lighting tab. Now right click the color map and select Edit Color Map. Create a New keycolor at -1 and set it to black. Create another at -0.8 and set it to black. Create a third at around -0.6 and set it to white then drag the keycolor to the left so it is right up against the one at -0.8. Set the Key color at 1 to white too. Set the cut off distance to 5km. Now by tweaking the lights Z position move it till it appears to shine out of the object but not appear under it. In my example I put it at -480m. You can also use these tricks to make headlights that shine from a car’s headlights that don’t start as unrealistic points or for street lamps.